The Eyes are part of the Arabian megaconstellation of the Lion (al-asad). The identification of these stars is problematic. Their description in the earliest surviving record is by Ibn Qutayba (d. 889), who says that these two stars are located right in front of the Forehead. 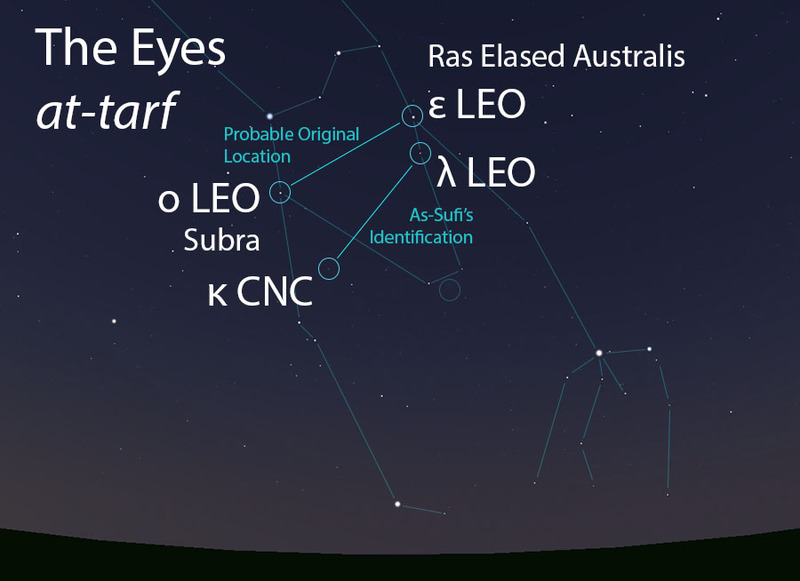 He also says that many stars called the Eyelashes (al-ash’ar) are located in front of the Eyes. Considering the well-estabished locations of the Tip of the Nose (an-nathra) and the Forehead (al-jabha) in the sky, the most likely candidates for the Eyes are two stars that lie in front of the first and last Forehead stars and are comparable to them in brightness. 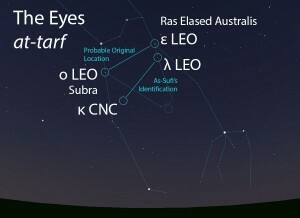 There are several fainter stars in front of each of these two stars that would fit the description of the Hairs, indicating the Lion’s eyelashes. A century after Ibn Qutayba, as-Sufi identified the Eyes as a pair of faint stars that are located in front of the brighter stars just identified, and this identification has stuck ever since. It is possible that the brighter stars were originally identified as the Eyes but moved to the dimmer stars to be located closer to the midpoint between the Tip of the Nose and the Forehead. The Eyes (at-tarf) as they appear in the west about 45 minutes before sunrise in early January. Sky simulations made with Stellarium. A pair of somewhat bright stars located in front of the Forehead (al-jabha). The Eyes do not figure in the calendar of the rains stars. In early listings of the lunar stations, the Eyes are the 11th station of the year. This was later changed to the ninth lunar station after the stations were adjusted to begin with the vernal equinox. The Eyes are part of the Lion (al-asad, الأسد) folkloric celestial complex, which extends from the Two Forearms (adh-dhira’an, الذراعان) to the Two Shanks (as-saqan, الساقان).